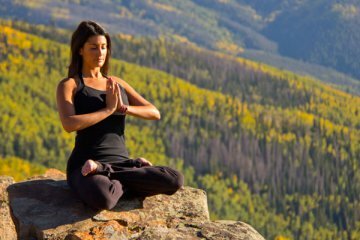 A common phrase heard in yoga circles is; “Yoga is not a competition”. While I admire the intent of this message, I rarely see teachers or students follow through on the philosophy of a non-competitive yoga environment. Correct, yoga is not a competition, but people are very competitive. If everyone is entitled to the same benefits of yoga, how can there be competition? The competitive trait exists within single cell organisms and can be found on the most advanced life forms on the planet. Competetiveness is considered to be a trait that coexists with the urge for survival. Species may compete with other species for resources to sustain life or may even compete with one another in the same species for the same resources. The urge to be competitive stems from a deep biological mechanism and is often overlooked or un-noticed as the source is deeply engrained in individuals. 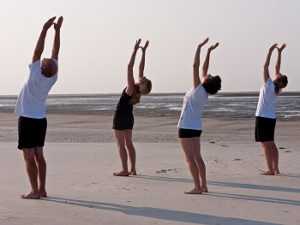 Students in a yoga class often enjoy the levels of advancement through yoga asanas. Many fundamental poses build the foundation for more advanced postures that can be meaningful goals to work towards. Some of these poses are fun and even beneficial, but working towards these goals can take on appearance of a competitive nature in group settings. Though yoga teaches us to take our journey inward, we have much to take in visually that may impede our ability to see yoga as noncompetitive. Yoga clothing companies often select young petite models to model and advertise their product line. Many yoga periodicals and magazines often depict poses that are accessible for few. New students aspire to the level of their advanced yogi peers and are often encouraged to look to the advanced students as examples of ‘correct’ alignment or expression of asanas. I have attended classes where teachers have rearranged students, putting the more advanced people in the front. While the intention may be good-natured, (to have the experienced in front as a visual aid), it can also cause a feeling of segregation, which can lead to cultivation of competitiveness. Rewarding equivocally with praise during class, showing favoritism towards students and publicly identifying a person’s weaknesses are other common mistakes teachers make towards cultivating a competitive atmosphere. Other subtle ways of creating an environment for competitiveness are found in the way a teacher sequences poses; the level of difficulty in the poses selected for the class; and the pace at which the class flows. Even language and word choice can define segregation between stronger and weaker students further solidifying a competitive atmosphere. Given these examples, it becomes clear that it is very easy to be competitive as it’s a natural trait. Because of our natural ability to be competitive in nature, we can sometimes unknowingly cultivate a competitive environment as well. The process can begin internally as simple comparison or indemnification and begin to externalize into words or actions. When considering how quickly we can move from being idle into the spirit of competition, it becomes apparent that simply stating something is ‘not competitive’ is not going to cultivate an atmosphere of non-competitiveness. Anything can be a competition. Competition is not necessarily a bad thing. Completion can be good when it’s a motivating force yet undesirable when it’s a discouraging force. Channeled correctly, the energy from the competitive trait can be quite useful even in yoga. The underlying energy of competition can be directed into methods of cooperation. It may prove more beneficial to utilize this drive and put it towards good use for students, teachers and yoga, instead of attempting to repress the competitive urge. The process of culminating a healthy competitive spirit and transforming it into a cooperative force amongst students will be unique for each teacher and possibly for each group of students. There are a few factors to consider if you attempt to make this shift. Stress perfect asanas less. Allow the reward to be the experience of the expression of the asana. Cultivate the environment where a student can find a comfortable edge in a pose, experience the extension of space, and benefit from the healing powers of asana and the breath. Ensure proper alignment is practiced, but put importance on the inward journey as well. Encourage students to cooperate with one another by routinely teaching a few poses that require partnering. Provide activities that allow students to support one another and share goals as a community. If you have groups with extremely competitive spirit, redirect the energy into a challenge that has fair boundaries for everyone. Even extend the challenge over the course of weeks or months and provide the means for students to support and encourage one another. Warning someone of their human conditions is not going to make inherent traits or qualities moot. Competition is the outward result of an innate drive. The energy that causes competition to flourish in our society stems from depths unfathomable. Tap into your inner creativity and redirect this abundance to work for yourself as a teacher or as a student. Transform this potent force into something full of mutual kindness for yourself and for your kula. Previous post: CLAW YOUR MAT! Next post: How Good is Your Teacher?